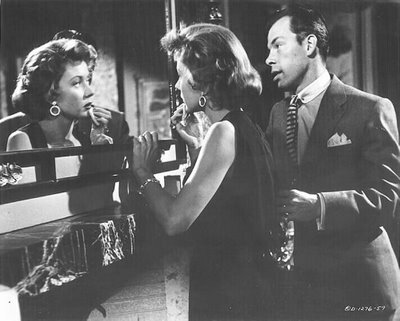 In honor of Gloria Grahame’s birthday, November 28, 1923, we are watching “The Big Heat.” Again. The Big Heat/1953/Columbia Pictures/89 min. “When a barfly gets killed, it could be for any one of a dozen crummy reasons,” says Police Lt. Ted Wilks (Willis Bouchey) in “The Big Heat.” Fritz Lang’s grim but gratifying crime drama from 1953 is laced with violence that’s still a bit shocking even by today’s standards. Barflys don’t get much sympathy in the fictional city of Kenport, an upstanding community full of white-picket fences and happy homemakers that also harbors a flourishing criminal empire and rampant police corruption. Wilks is talking to an upright cop, Det. Sgt. Dave Bannion (easy on the eyes Glenn Ford), about the torture and murder of Lucy Chapman (Dorothy Green). Lucy was the girlfriend of police sergeant Tom Duncan, also dead; his suicide is the film’s opening scene. Tom’s widow Bertha (Jeanette Nolan) is not what you’d call crushed at her husband’s demise and she’s martini-dry as she answers questions from Bannion. Bertha claims her husband was ill, hence the suicide. Bannion got a rather different story from Lucy Chapman. Unlike Tom Duncan, Bannion seems to have a perfect wife, the golden-haired Katie (Jocelyn Brando, Marlon’s sister), and a cute little daughter, named Joyce. As Mr. and Mrs. Bannion share smokes, sips of drinks and steaks, they banter easily and make each other laugh. In addition to questioning barflies and ungrieving widows, Bannion noses into the business of an oily mobster named Mike Lagana (Alexander Scourby), a vicious operator whose right-hand man is the lithe and snarling Vince Stone (Lee Marvin). Grahame and Ford have sizzling chemistry. Shortly after the exchange in Lagana’s living room, a car bomb meant for Bannion kills the lovely Katie. Bannion doesn’t take much time to mourn; instead, with eyes glazed, he’s hellbent on proving the link between the police and Lagana’s mob. Suspended from the force, he seeks vengeance on his own, setting the pace for ’70s vigilante cops such as Clint Eastwood‘s Dirty Harry. As Bannion obsesses over hate and revenge, in a chilling transformation of character, he becomes the moral equivalent of the gangsters he despises. Known for stark, intense visuals, here director Lang contrasts gloomy, barlike shadows that bind the characters to their destiny with shocks of scouring white light suggesting revelation. Lang was also known for being difficult with cast and crew, but Ford for one never saw Lang’s tyrannical side. In “Glenn Ford: A Life” by Peter Ford, the famed actor describes his experience: “Fritz Lang came out of the old German studio system, where the director was like a dictator, barking commands and making people jump. He had a pretty nasty reputation in some quarters. There were people in Hollywood who had worked with him who hated his guts, especially some of the crew guys down the line. I mean, there were stories of people throwing lights at him and threatening to kill him for the way he treated them. 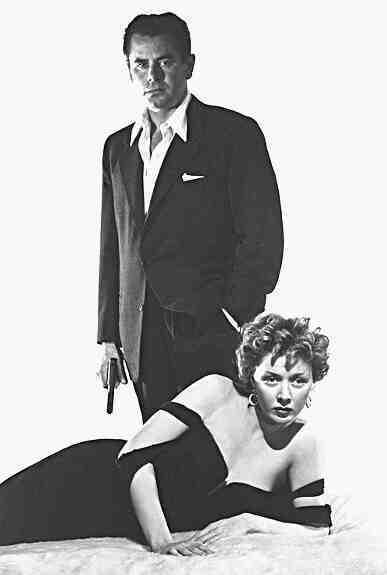 Gloria Grahame and Lee Marvin: a couple with, um, a problem or two. “The Big Heat” drew inspiration from real-life events a few years before the film was made. 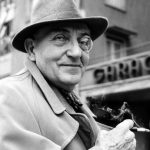 When the U.S. Senate set up the Kefauver Committee to probe organized crime, televised hearings brought the Mafia into the consciousness of the American public. Sydney Boehm wrote the script from a serial by William P. McGivern in the Saturday Evening Post. And of course, any time crime’s on the rise, you know loose women are involved, which brings me to the pièce de résistance: Grahame as Debby. Though she doesn’t get a huge amount of screentime, she’s funny and fresh, and brims over with sexpot charm – striking the perfect balance between waifish, wide-eyed vulnerability and pleasure-seeking sophistication. Once Debby realizes the depth of Vince’s depravity – burning a young woman’s hand with his cigarette is small potatoes to this guy – she switches her loyalty to the righteous but rigid Bannion. And when Vince learns of her betrayal, she gets burned, literally, with a pot of boiling coffee. We hear, but don’t see, Debby’s wounded reaction in one of the most famous moments in the movies. With her looks gone, Debby tells Bannion everything she knows and commits the murder that will bring down the syndicate. Oh, and throwing coffee? Two can play at that game. I’d like to see a Starbucks barrista do better.